The other day I posted about the valance I made from scraps of fabric I had left over from various projects. 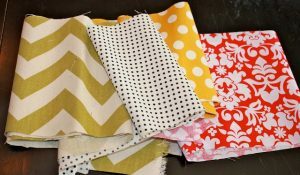 Today I’m sharing another project (for the laundry room) using a few of those fabrics as well. I purchased some cardboard letters from Hobby Lobby and traced them with pencil on the back of each fabric I chose. And sprayed all sides of each letter. Then I added the fabric to the tops of each letter with spray adhesive. and hung them using Command Picture Hanging Strips.